OK first made contact with Doug Castle through the website in July 2010. OK had purchased a Ruby via ebay that had a CA7C sticker on the windscreen and wondered whether we could give him any history of the car. 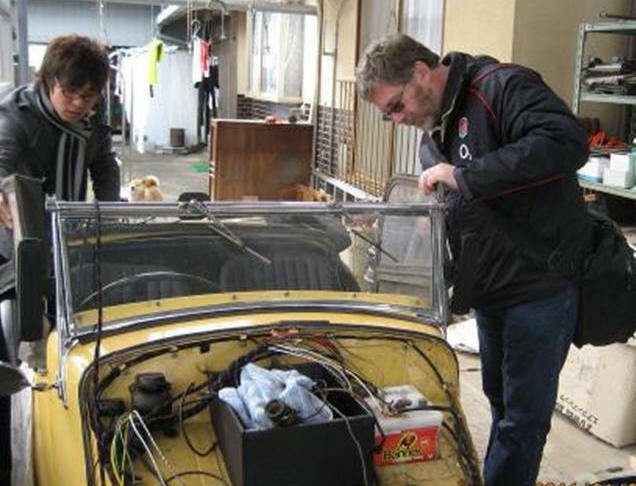 The car had belonged to Tracy and Stephan Espin at Launceston and had been sold to a local garage who subsequently advertised it on ebay. We keep in contact with OK and email him a copy of FOCUS each month. This month we invited him to tell us a little about himself and the cars new life. Hi, first I will introduce myself. My name is Ikuo Okano and I live in Shiga which is on the east side of Kyoto, Japan. I’m 51 years old and am an engineer. I was very pleased to be asked to write an article. I like small cheap cars for 3 reasons. They are easy and cheap to maintain and fun to drive. Modern cars are difficult to maintain because of their CPUs, sensors and crowded engine bays. Old cars are very simple. I can maintain them using manuals and cheap tools! Especially British cars because many parts are easily obtained. Of course I don’t dislike Rolls Royse or Bentley cars but I can’t drive them to do daily shopping, nor go to my office. However I can use an Austin or an MG every day without consideration. 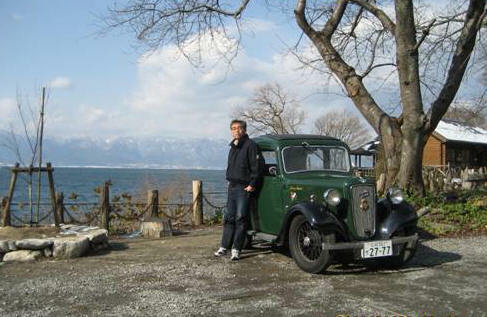 In August 2009, my friend Nishio, who has restored some pre-war cars said to me that an Austin Seven is interesting and their price was reasonable. We could get parts to repair them on the internet and maintain them ourselves. I had an interest in a pre-war car so I studied about Austin Sevens. 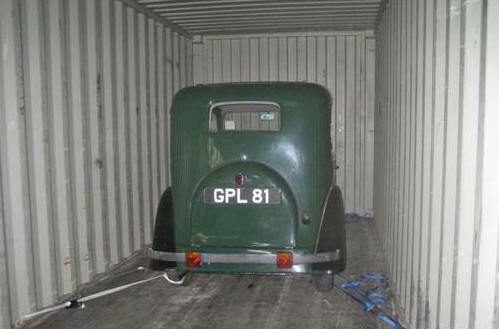 I searched for an Austin Seven on ebay. I liked best an RN on initial looking. I wanted to use it daily. The Ruby has auto advance ignition and synchromesh on second gear. It would be easier to drive than an RN. So that decided it. After about a month I found a good condition Ruby and bid for it. CA7C members may know the car well. I asked Mr Nishio to import it for me. He is not a professional dealer but had imported many cars from England. I collected the car from Kobe port in November 2009. The first time I tried to start the engine it wouldn’t run. I found petrol leaking from the carburettor. I dismantled it but couldn’t find out the problem or understand how it worked! I thought an SU carburettor would be better than a Zenith. I searched for and found a 11/8 SU on ebay. I fitted the SU and the car started easily, I was very pleased. I had to have the car registered in Japan. Japanese registrations have many requirements. Examples are head light brightness, winker lens must be more than 20 sq cm and diameter must be more than 51 mm. 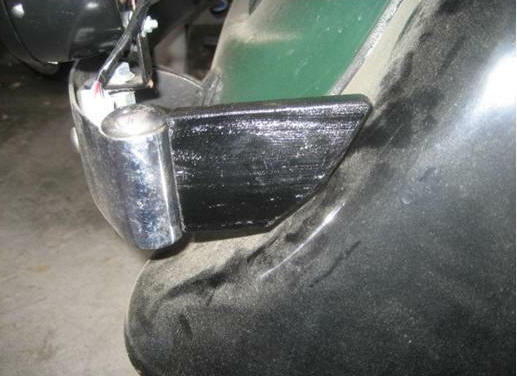 The clearance between the body and the bumper must be less than 20cm. There were many other requirements. The headlights were too dim and I wanted to use the car daily as well as for events. So I decided to change from 6V positive earth to 12V negative earth. The technical articles on CA7C’s website were very useful to me. My headlights are now 35/35W halogens. I use my car three or four days a week. I go shopping, go training and go to the office. I drove 860 miles during four months of last year. I’m sure the car cannot run as well as a new car. The brakes are poor and as I start from the lights I hold up other cars. But it is fun for me to drive! People that I don’t know speak to me. What is the name of the car? What capacity is the engine? When was the car made? I answer them with pleasure. 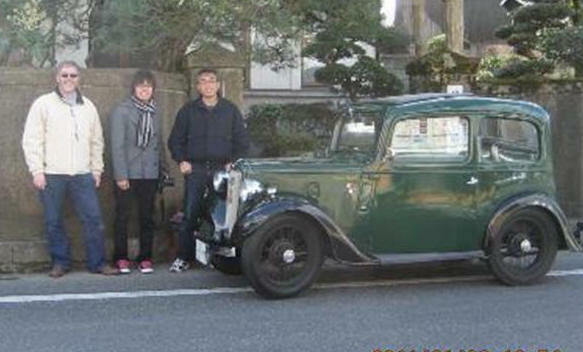 In Japan we only see pre-war cars in events. 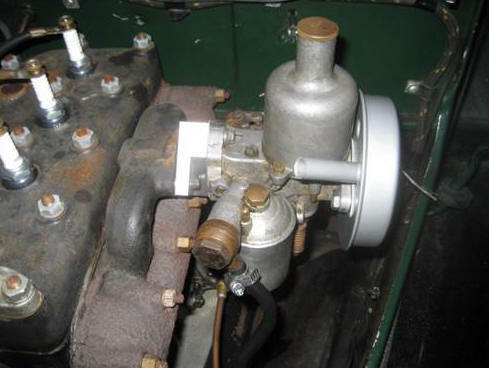 My Austin Seven is very unusual even for someone who has little interest in cars. My fiends in the office or neighbourhood say that they like the colour and that it is very cute. Some of them ask for a ride in it! 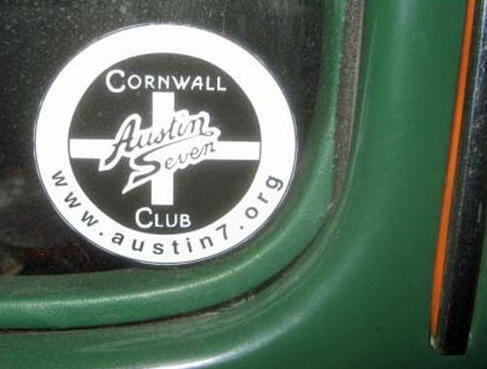 By the way, there are 3 men who own an Austin Seven near me. One has a Tourer and the other two have Nippies. On of the men is only 19 years old! He is restoring it. 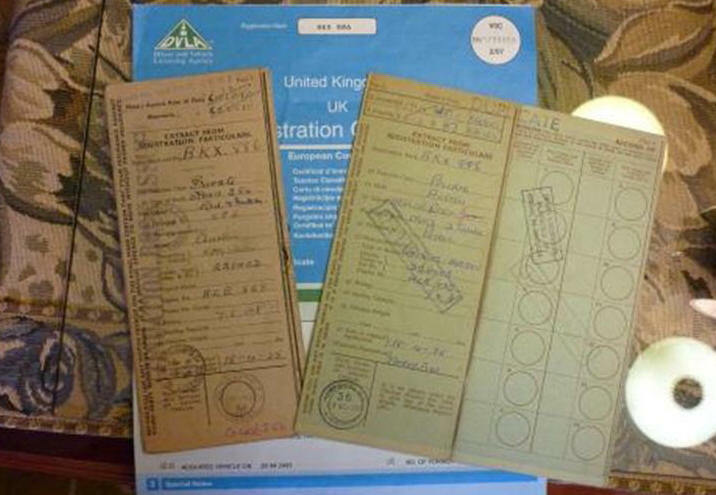 Another man who is a university student bid on an Ulster last November and it is now on a ship coming from the UK. 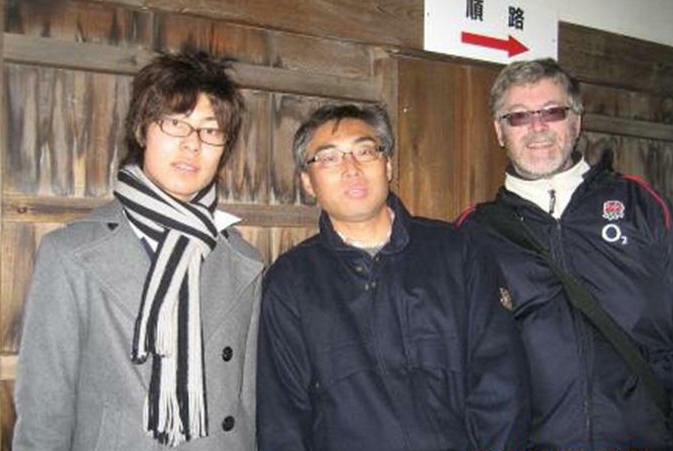 When it gets to Japan he will be the 5th man. You think there are some strange people in Japan don’t you? I’d like to thank all the readers of my article. Best wishes to everyone from Japan. This article, written by Ikuo Okano, originally appeared in Seven Focus February 2011 pp10-11. OK lives to the south-west of Tokio and was not directly affected by the earthquake and tsunami in March 2011. Our Magazine Editor, Geoff Hardman, goes to Japan regularly with his work. The office is about 30 miles from OK's home and so with a free weekend Geoff was able to meet OK on 30 January 2011 and enjoy a day with him and his friend. So, what’s your idea of a perfect Austin Sunday? Take a ride along the coast? Spend some time getting greasy under someone else’s car? Visit a castle or a special historic site? Or maybe just a nice cup of tea with friends?So, what’s your idea of a perfect Austin Sunday? Take a ride along the coast? Spend some time getting greasy under someone else’s car? Visit a castle or a special historic site? Or maybe just a nice cup of tea with friends? Yep, me too. So I was very fortunate to do all these things on the last Sunday in January. The difference being that I was just over 6000 miles from home. Remember last month, when Mr Okano, (OK to his friends), sent us some pictures of his Ruby? Well, as I had, most unusually, a free weekend in Japan on my own, a couple of emails later I had a trip all planned up. OK lives about an hour by express train northeast of Osaka, at Ohmihachiman on the shores of Lake Biwa. This isn’t a lake Stithians style, this is the biggest lake in Japan, with magnificent mountains surrounding it. Thanks to an icy blast from Northern China, they also had a good 8” of snow! OK met me at the station, where we also met his friend, Mr Sugimoto, who joined us for the day. Parked outside the station was OK’s Ruby. You remember, it used to live in Launceston! Looking absolutely splendid with a lovingly applied polish, the Ruby is in tip top fettle. There’s a couple of basic reasons. The Ruby is OK’s pride and joy, and he drives it very regularly. Actually, every day, as he uses it for his 5 mile commute to work. Far enough to get everything warmed up, and often enough that nothing seizes and every foible is dealt with promptly. He had to do two modifications to be allowed to use it in Japan; the bumper had to be moved closer to the rear wings and the indicators had to be upgraded. In addition, OK has added some simple lap seat belts from floor anchors. Not essential, but he feels much safer with them fitted. In the typical Japanese drive for efficiency, it now sports 12V electrics with LEDS for every light except the heads. The three of us pile in, gaining the now so familiar gazes from passers by, and its off to Ohmihachiman shrine for tea. A short drive brings us to the temple area tea room, where we make our introductions. OK regards his English as poor, but actually, he’s pretty good. Just as well considering the standard or my Japanese. Sugimoto san is fluent: He’s a 19 year old architecture student with a Nippy in restoration and very big plans. As is customary, I have taken a small gift – in this case, a copy of Jonathan Woods’ book and one of Lorna’s CA7C badges. OK is thrilled by this latter item: he has the CA7C sticker in the side window but is bursting to fit the badge to the radiator, near his St Christopher. We take a tour around the temple, with OK very patiently explaining the proper way to ritually cleanse your hands before entering. It’s just as well that we hadn’t started anything too greasy at this point. It is a very peaceful and beautiful place, made more so by the sharp winter sunlight. OK has brought a camera and tripod, so group photos are a must. Next, we head to Hino city, to Sugimoto san’s grandfather’s house. There, under a cover, is his Nippy. The bodywork is in very good condition, but his major worry is the engine. It’s being treated to lots of nice new parts and go faster goodies. In Japan, getting hold of Honda pistons is Mundai Nai! (No problem!) I am barraged with questions, some of which I can help with and others will take a little research. It’s greasy time, so we grab a jack and a couple of blocks of wood, and the Nippy is up in the air while we have a bit of a play with the Bowdenex. They’ve got a bit gummed up over the years but after a bit of fiddling, we breath life into the system. 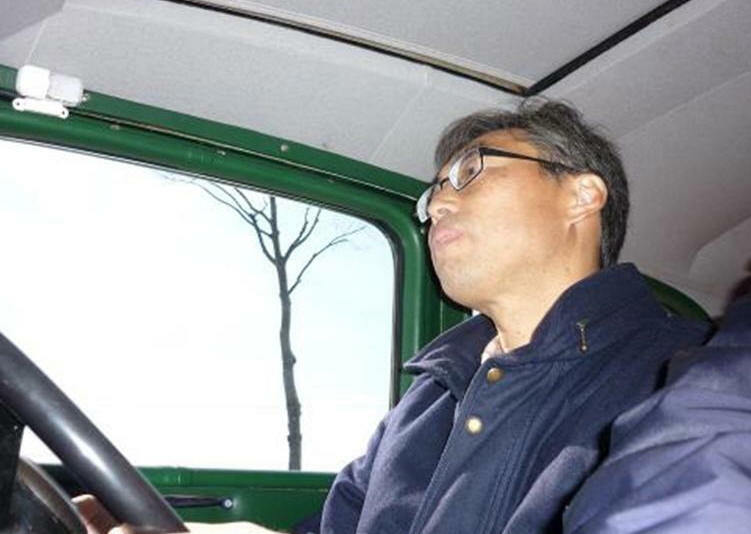 There’s a new wiring loom just fitted, and some minor hinge rehanging on the cards, but Sugimoto san is confident that he’ll get Nippy on the road later this year. Over tea, he shows me what would be an interesting set of documents anywhere in the world, but more so because of where he lives. There’s the Green and Brown log books and the modern V5 all together. Many of us don’t have all of them in the UK, so its great to see them together as a set. Its time to cover up the Nippy and head to our next stop. We visit an ancient town of merchants, that formed one of what in the west would become friendly societies. The Omian merchants believed in lots of trade, low interest rates and reinvesting in society. All of this when Britain was still very feudal. They made enough money to be comfortable, and spent the rest on education. Many of the Omian shops are unchanged to this day. Back in the Ruby, we whizz off towards the mountains. The roads are wide and gently winding, thankfully with not too much snow on the surface. Three up, the Ruby keeps a good pace with the rest of the traffic, bumbling at a nice 45mph. OK even adds to the mood with some hot ‘30s jazz on his MP3 player. We grab a quick lunch of hot noodles in a café, where the green and black curvy car looks so conspicuous in amongst the angular, almost cubic “Kei” (city) cars from Honda, Daihatsu and Nissan. Our penultimate stop is the magnificent Hikoni Castle. Built on top of a major earthwork in 1622, it features some of the most astounding joinery in its construction. Rather than fuss about making straight beams, the castle is constructed on a less wasteful approach of finding just the right trees to interlock when assembled into a roof frame. No two beams are the same, but they form a soft, interlocking jigsaw that today would be featured on Channel 4’s Grand Designs. The sun is beginning to set, so we round off our 70 mile trip. It’s back to OK’s house for a final cup of tea before its time to leave for my train. Here he springs a wonderful surprise. He’d mentioned that we would take time to swap photographs, but instead he printed a set of high quality photos and presented me with a stunning lacquered album, decorated with a Samurai helmet on the front. Inside, there were maps of where we had been, an itinerary, and places to keep my entrance tickets. All too often, our digital pictures languish on a hard drive somewhere, but this was such a generous keepsake. As the time to catch the train gets nearer, we drag ourselves away from OK’s collection of motorbikes, and we’re back in the Ruby to go to the station. It’s fully dark by now, and the Ruby springs its last surprise. 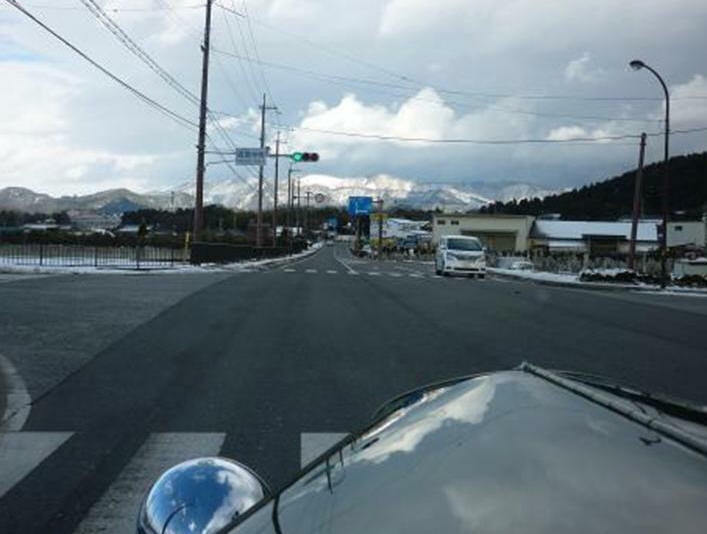 In Japan, it is considered polite to extinguish your headlights when stationary at a junction. So OK has made a modification to the Ruby wiring, so that the headlights are only on when the dynamo is charging. As we slow down for a junction, they dim a little then settle to just the warm glow of the sidelights. As we pull away, up they come like the house lights at a theatre. For all you paranoids about having a slight discharge on main beam, and worried about whether the battery might hold up at night, this might be for you! Back at the station, Sugimoto san and I take the express back to Osaka. He steps off after a few stops, as the train drops him near his home. An hour later, I’m back at my hotel having had a most excellent Austin Sunday. To OK san – my sincerest thanks for a really wonderful day. This article, written by Geoff Hardman, originally appeared in Seven Focus March 2011 pp22-27.